Running an auto auction without quality markers is a waste of your valuable time! Naturally, someone dealing with so many cars in such a short amount of time needs to have a quick and convenient way to mark their vehicles without skipping a beat. Markers 4 U, Inc., is proud to offer high-end paint marker selections for your needs, including Uni-Paint markers and Sakura markers. With these great selections, you can mark confidently without having to worry about your marks rubbing off. Many people who work in the auto auction industry have come to rely on Sharpie and Uni-Paint markers, as well as Sakura markers, to make strong, prominent marks on their vehicles while they are making sales. These selections are made to work in a variety of jobs, even marking through oil, grease, rust, and snow. 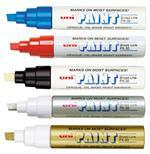 Review the selections available here and place an order for the perfect paint marker for your needs. Sakura Solid Markers for big tough jobs. It marks through oil, grease, rust, mud, snow - inside or outside. It is absolutely permanent. Solid markers won't fade or wash off like chalk. The special "stay fresh" twist top keeps paint fresh and ready to use. Low chloride and low halogen solidified paint formula ideal for environments where metal fatigue is a concern. Marker contains less halogens (Br, Cl, F, I) and metal ingredients (Zn, Pb, Hg, Cu, Fe, S) meeting RRDT F-7-3T requirements and is non-toxic. Sanford's solid paint marker in a twist tube container. 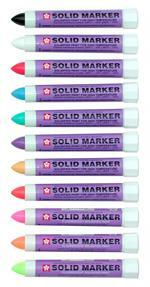 These markers are equivalent to the Sakura Solid Paint Marker. 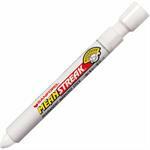 Use to mark tough surfaces. Up to 1/2" line. Available in 7 bold, weather resistant, fade proof colors. Chisel point nib is approximately 3/8" wide. Sold here individually.